Hi, there! I'm Amy Butler Greenfield, and I'm delighted to welcome C J Busby, author of DEEP AMBER, to the Enchanted Inkpot today. 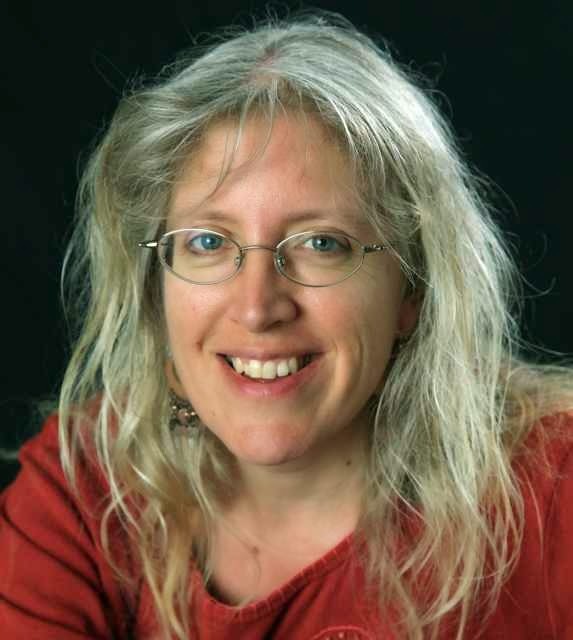 I was lucky enough to meet Cecilia in person last autumn at the World Fantasy Convention in Brighton, where she read an extract from DEEP AMBER that was full of humour and action and absurdity - a perfect combination for middle-grade readers. Here's a quick summary of DEEP AMBER (Templar UK / March 2013): People and objects are moving between different worlds – and somewhere there is a very powerful piece of deep amber causing all the mayhem. Can siblings Cat and Simon join forces with apprentice witch Dora and castle mischief-maker Jem to find the amber before it falls into the wrong hands? DEEP AMBER is a wonderfully funny book. What advice do you have for writers who want to make kids laugh? I’m so glad you found it funny! My books are mostly what you’d call fantasy adventures, but I do like to inject a bit of humour, too. I love to hear my readers chuckling, and if they have proper laugh-out-loud moments I feel I’ve done my job well. It’s hard to give advice on this, as I’m not consciously thinking ‘what will make kids laugh?’ – the humour just comes out of the situation. Usually there’s the odd character who doesn’t quite understand what’s going on, and with the best will in the world somehow manages to create chaos. I also have a soft spot for characters who add a bit of rolling-eyed sarcasm into the proceedings. I have a quite childish sense of humour myself (I’ll always laugh at any Laurel and Hardy type mayhem!) so maybe that helps. That's great advice! For me, part of the fun of DEEP AMBER is the way it switches between the fantasy world of Dora, the apprentice witch, and the modern-day world of Cat and Simon. Which world did you most enjoy writing about? When I started the book, it was from the point of view of the modern-day world, and it was originally going to be from that perspective only. But I found I just couldn’t get the tone right, And then I tried starting from the other world first, and it just took off. Maybe because my previous books had been based firmly in that kind of Arthurian setting, so it felt comfortable. Both worlds were fun to write, but what I enjoyed most were the bits where they collided – the knight trying to follow his quest in the middle of a modern market town, or the castle kitchen boy trying to work out what a Nintendo DS does. What were your favorite books as a child? And when did you first start reading fantasy? I read all sorts as a child. I loved history, fairy tales, fantasy, adventures, funny books. The earliest writer I remember being aware of was Enid Blyton, and I raced through all of the Famous Five and Malory Towers series. Then for a long time my favourites were Richmal Crompton’s William books, which are hilarious. But at the age of ten or so I would have answered the question “Who is your favourite author?” with one name: Diana Wynne Jones. At the time that would have been based on only one book – Eight Days of Luke – but it was so amazing, and so unlike anything else I’d read, that I was a die-hard fan from that moment on. I also loved John Masefield, Alan Garner, and Susan Cooper’s Dark is Rising sequence. Apart from Tolkein, though, and a few others, I’m not a big fan of high fantasy – I generally prefer the more Jones-like mix of magic, humour and the real world. Before writing DEEP AMBER, you wrote a very successful series (FROGSPELL, CAULDRON SPELLS, ICESPELL, SWORDSPELL) for slightly younger readers. Was it tricky to make the switch to a new series? Yes, it really was, and I wasn’t expecting it to be! I hadn’t realized how much background knowledge of your characters and the world they live in you draw on when writing later books in a series, and then suddenly, there it all is to build up again from scratch. What made it worse is that in the previous series I’d had a fair few ready-made characters, like King Arthur and Merlin – and although you do reshape them and make them your own, there are some givens that you start from. In the new series, everyone had to take shape just from my own head! It could have been liberating but was actually rather daunting. I learned a lot about the craft of writing in struggling through that process. Speaking of the craft of writing, there's an important secret in DEEP AMBER that's hidden with intriguing mix of alchemy and runes. Do you have any advice for writers and readers who want to create their own riddles and secret codes? I always loved secret languages and symbols as a child (my sister and I used to try and write messages to each other in Tolkein’s Elvish script – although we could never properly decode each other’s notes!) So I enjoyed putting that puzzle into Deep Amber, and searching for the exact combinations of runes and alchemical symbols that would say what I wanted. It’s quite tricky, as there are a number of different interpretations of some of the runes, and my editor and I had to go over it a few times before it worked. It had the advantage of making a nice little extra for David Wyatt to illustrate. The main advice I’d have for other writers, I guess, is that you have to check and re-check your logic, because children will definitely spot any flaws! You had a remarkable childhood, living on a series of boats and then on the site of a Welsh ruin. Did any bits and pieces of that life find their way into DEEP AMBER? There are a few, yes. Albert Jemmet is the name of a barge captain who worked with my dad for a while, but the character in the story is not at all the same - he’s more like my dad, in fact. Then there’s my younger brother, who bought a sword on ebay when he was seventeen. In the book, there’s a scene where Simon gets a bit wild with the sword that’s magically appeared in their house, and he chops up his mum’s washing-line and slices the arm off the sofa… Well, that’s not a million miles away from what happened in real life. Needless to say, my brother’s sword was swiftly confiscated! I suppose what my childhood really gave me, though, was a sense that life ought to be adventurous, and also that grown-ups were quite likely to be quirky, interesting and in on the adventure. I tend to make my grown-up characters part of things, whether as allies or enemies, rather than shadowy background figures. A sense of adventure is a wonderful gift! And it’s great to see that DEEP AMBER won't be the end of this adventure, since it's the first part of a trilogy. Can we persuade you to reveal any secrets about the next books? Well, there are two more bits of magical amber to be found by the end of the first book, and the race is on to find them before the sinister Lord Ravenglass and his dark-suited allies can get their hands on them. So the next two books follow that struggle into a couple of new worlds: one, a hot desert world of temples, bazaars and dragons, and the other a watery world of sailing ships and pirates. The final showdown will be back in our world, but it may involve a chase backwards in time… I’ve nearly finished book 2, which I’ve really enjoyed writing, but there’s a bit of a dispute over the title at the moment, which will either be DRAGON AMBER or FIRE AMBER. The final book, though, will be called THE AMBER CROWN. I’m very excited about getting started on it! And we're excited that you're working on it! Thanks so much for taking the time to visit with us. Cecilia's publisher, Templar, has very generously provided TWO copies of DEEP AMBER for two lucky Inkpot winners (UK residents only)! All you have to do is leave a comment here and make sure that we have some way of contacting you. The giveaway will run until midnight GMT on March 29th, and two winners will be chosen at random. Good luck! Amy Butler Greenfield was on her way to a history Ph.D. when she gave into temptation and became a novelist. Now an award-winning writer, she lives with her family in England, where she eats chocolate, bakes cakes, and plots mischief. Her most recent book is the YA historical fantasy CHANTRESS (McElderry / S&S, 2013). 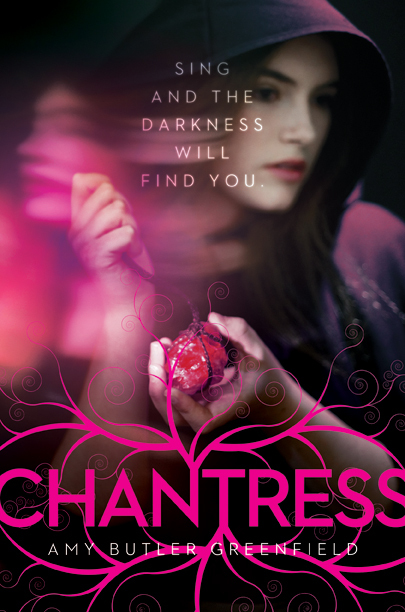 Its sequel, CHANTRESS ALCHEMY, comes out in May 2014. You can find her at www.amybutlergreenfield.com. What a wonderful interview. And what a fun, adventurous way to grow up! Thanks, Ron! I really loved doing this interview. Very jealous of you growing up on boats, Celia! And looking forward to Deep Amber! I felt a bit jealous as well, Sandra! Great interview - would love to have a chance at the giveaway. As a big Diana Wynne Jones fan will be interesting to see the influences! My 10 year old daughter, Molly, says "i loved the book and all the characters, especially Albert jemmet. Deep Amber appealed to my sense of humour, and I can't wait to find out what happens in the end!". Ah - thanks everyone! I'll be interested to see what you think, Emma - I'm sure you'll spot loads of little DWJ details. These things burrow into your subconscious and you're not even aware sometimes of where they came from! I'm looking forward to reading this - a fantasy adventure with humor - it sounds fabulous! Thank you both for the interview! Thanks to everyone who entered the giveaway! The winners are Sandra Greaves and Emma Barnes.